When faced with a defaulting tenant, a commercial landlord must carefully navigate the process of obtaining possession of the leased premises, collecting unpaid rent and perhaps disposing of the tenant’s equipment and personal property. This blog provides and an overview of the available options and some important points that commercial landlords, and their counsel, should consider. Unlike in a residential context, the rights and obligations of the parties in a commercial tenancy will primarily be determined by the terms of the parties’ lease. The lease should be carefully crafted to maximize the rights of the landlord and protect the landlord’s interest in both the property and rentals due. These rights should include an express provision that grants the landlord the authority to retake possession without resorting to the courts in the event of a tenant default. Commercial landlords are allowed under the common law of North Carolina to use self-help repossession to regain possession of space from a tenant in default, so long as no breach of the peace occurs. It is important to note that the courts define “breach of the peace” broadly so that any objection by the tenant to the taking of the space means that the landlord’s sole lawful recourse is to remove the tenant by summary ejectment (discussed below). In practice, self-help repossession is most commonly accomplished by simply changing the locks at the leased premises when space is vacant. Furthermore, landlords who use self-help should only do so in the clearest of cases involving monetary breach. If a court finds that the landlord acted wrongly in pursuing self-help repossession, the landlord may be exposed to liability. Summary ejectment is a lawsuit commenced by the landlord’s filing and service of a summons and complaint. The case is heard in small claims court in the county where the leased premises is located. The trial is held before a magistrate judge and without a jury. At the trial, the landlord must be able to prove that: (1) the lease was breached; (2) the breach is one that results in forfeiture either by the terms of the lease or by statute; and (3) that it complied with the applicable notice and cure provisions, if any, contained in the lease. 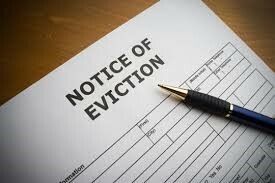 If the landlord prevails, the tenant has a 10-day period following the entry of the judgment to appeal. No action by the landlord to remove the tenant can be taken during this 10-day period. Does the lease expressly provide that a summary ejectment does not terminate the tenant’s liability for future rent? If it does not, then the decision to proceed should be reconsidered. If the landlord desires to recover damages in excess of the jurisdictional limit of the small claims court, it should only seek to regain possession in the summary ejectment action. In the event that the landlord seeks damages in the summary ejectment up to the jurisdictional amount, the doctrine of res judicata will bar any later action for additional damages. A separate action may be brought to recover damages for unpaid rent after the summary ejectment proceeding. A final consideration is how to deal with tenant equipment and trade fixtures in the leased premises following a default. The lease should expressly provide that the landlord has a security interest in all items in the space and this lien should be perfected by filing a financing statement. In this instance, the landlord should have the right to dispose of tenant property through a public or private sale in accordance with the Uniform Commercial Code. If the landlord does not have a security interest, it may still have a lien on the tenant’s property under N.C. Gen. Stat. 44A-2(e). A lien is created under this statute when (1) the tenant has vacated for 21 days or more after the paid rental period has expired, and (2) the landlord has a lawful claim for damages. If these criteria are meet, the landlord may conduct a public sale of the property. In closing, we highly recommend that landlords retain legal counsel experienced in litigating commercial lease disputes when dealing with a defaulting tenant. Please give me a call at (919-821-7700) or email me at [email protected] if you need assistance with any of these issues.